The legendary Chicago ice cream sundae at Zonar's. 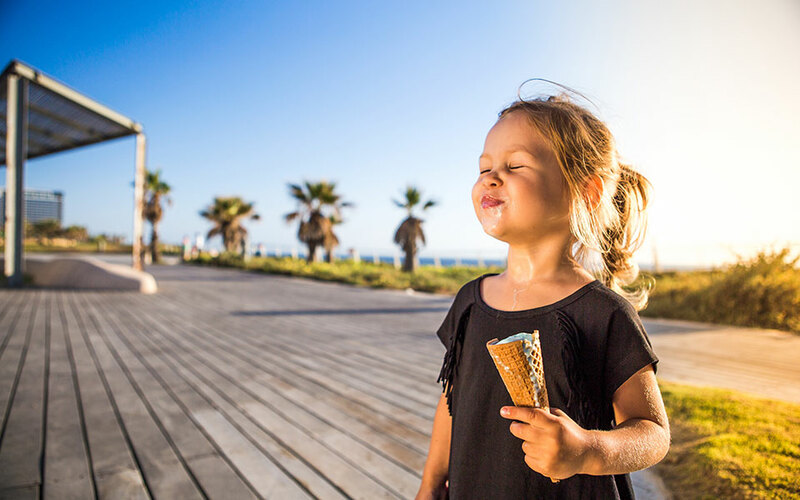 Artisanal ice cream shops mix tradition and innovation and serve flavors made with fresh ingredients that remind us of family vacations. Once upon a time in the late 1800s, all ice cream was artisanal. It was a rare treat, reserved for those with access to an ice house, made locally and in small batches. By necessity, before ice cream trucks and electric freezers, everything was local, and everything was fresh. The company that introduced it to them was EVGA, and it was sold by street vendors called “pagotatzides” – a new profession in the city – who walked the streets with ice cream tucked into carts full of ice and salt. The heat was a problem, but also a reason for the huge success of the frozen treat. Ice cream has the ability to tug on the nostalgia-strings. It evokes childhood memories and is so universally appealing that it easily bridges generations. It is easy to imagine a queue to an ice cream cart in the 50s: children tugging on the flower printed skirts of their mothers, begging them to make it move faster. While new flavors are fun, we like our frozen desserts best when they somehow remind us of wholesome family vacations. Today, ice cream producers accomplish this in various ways. As far as big producers go, two of the most famous Greek ice cream companies have been sold to large multinationals (Nestle bought Delta Ice Cream in 2006 and EVGA’s ice cream production was taken over by Unilever in 2010), but those that remain seem to want to hold on to what’s traditional. Kri Kri is the most famous company that is still purely Greek, and still headquartered in the northern city of Serres, where it was founded in the 1950s. Among the most famous of their first ice creams was the “kassato”, a rich ice cream made from sheep’s milk, often thought of as the “original” Greek ice cream. Their recent additions called “Mama’s desserts” have flavors resembling sweets that today’s generation of Greeks grew up eating. Another company on the rise, Kayak, makes many flavors of ice cream using traditional, strained Greek yogurt. However, what’s even more interesting is that you can still find fresh, locally made small-batch ice cream. In fact, it’s trendy again. The pagotatzides of today are mainly artisanal small producers who have returned to the tradition of making their desserts locally and daily. So if you have time to visit an actual ice cream shop instead of getting a pre-packaged cone from a kiosk, the experience might be closer to that of the first ice creams made in the country over 80 years ago. Like the mass producers, many artisanal ice cream and gelato makers copy the flavors of other traditional desserts. 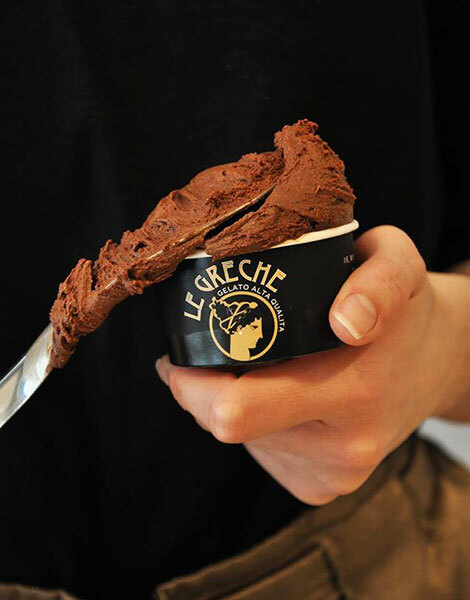 The famous gelato shop Le Greche, on Syntagma square, for example, makes Italian flavors like mascarpone with caramelized figs, and Sicilian pistachio, but also the wonderful baklava & cream. At Ninnolo in the northern suburb of Kifisia, you can try ice cream flavored with tahini from the island of Limnos and excellent soft serve, while at the new shop -14 in central Athens, you can get your choice of ice cream served in a bowl made from kataifi pastry. 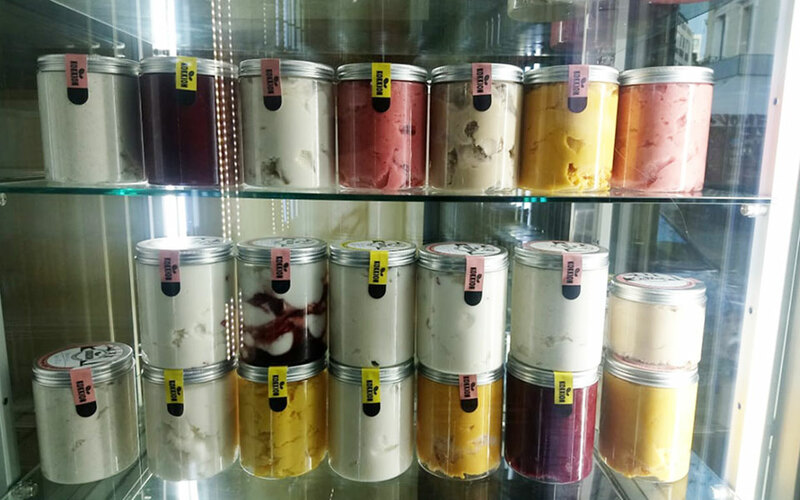 At Fatto a Mano, in Peristeri, everything is made from scratch, and you can find flavors that are interesting for ice cream and typical for Greece, like lemon basil and “anthotiro” cheese with Cretan honey. Others are even bolder. 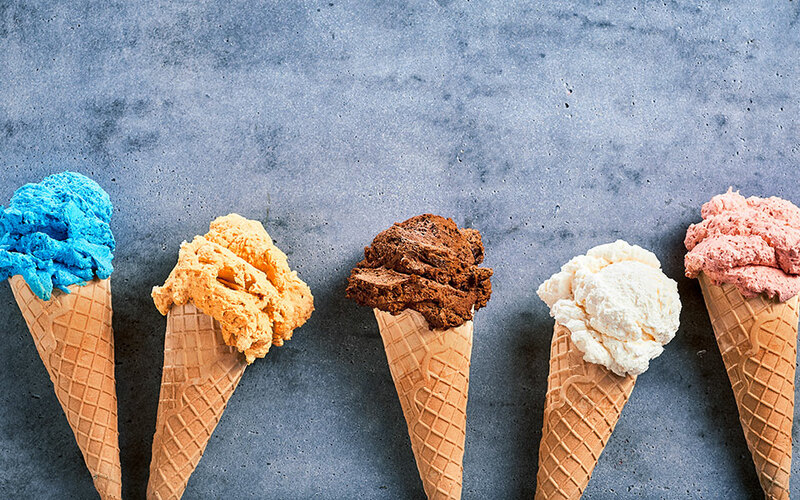 At the brand-new artisanal ice cream shop Kokkion, in Psyrri, you’ll find flavors such as the mild raw almond and tonka bean, halva, chocolate passion fruit, and tangerine ginger sorbet. Before you order here, make sure you hear the day’s special. Another innovative option in the center is Cremino, serving few but fun flavors like turmeric. 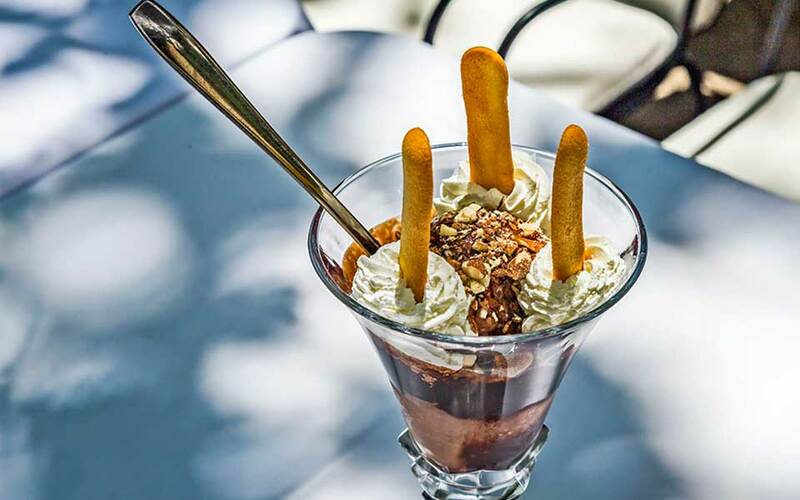 In southern Glyfada, the always popular Bufala Gelato serves delicious flavors in egg waffle wraps, and a stone’s throw away, Ice Roll makes “stir-fried” ice cream to order. At the latter, coconut milk makes a delicious alternative to dairy. Another stir-fried ice cream shop, Chocotopia in central Athens, make theirs with goat’s milk and honey instead of sugar. 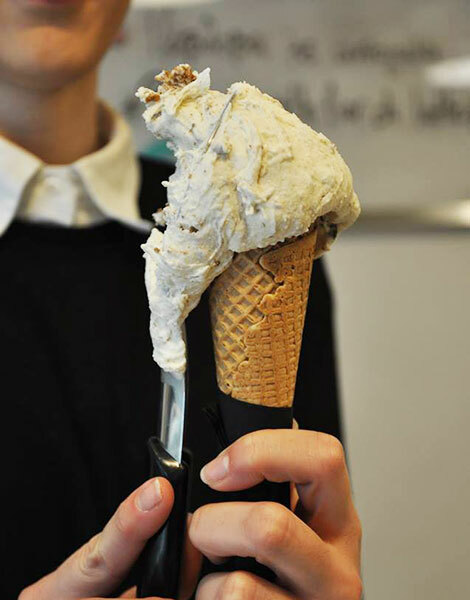 If you like to stay healthy, Solo Gelato in Halandri offers more sugar-free flavors. 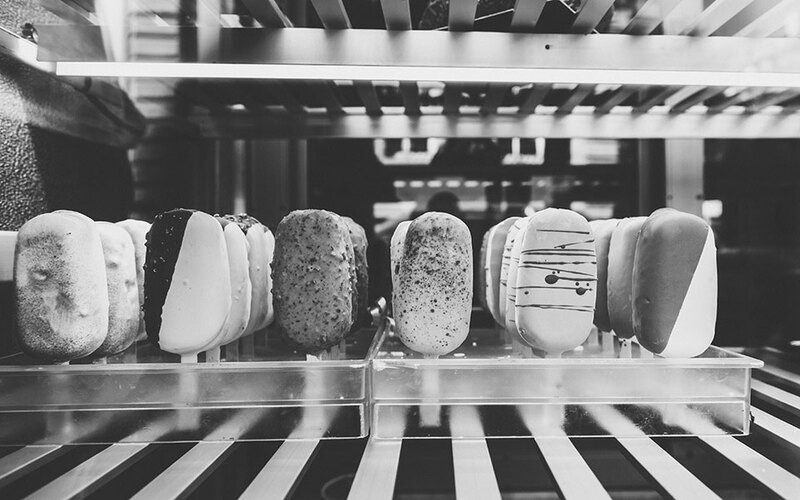 If, however, the artisanal aspect isn’t enough to make you feel like you’ve traveled back in time, the best option is to head to one of the city’s surviving old pastry and milk shops. Here, you’ll find the old fashioned kassato and kaimaki (an elastic kind of mastic-flavored ice cream made with sahlep powder from the roots of orchids) and few but classic flavors like vanilla and parfait. For this type of experience, we love Varsos, in Kifisia, Bakogiannis, in Ilioupoli, Asimakopoulos, in Exarchia, and Papaspyrou, with shops in Ampelokikoi, Halandri, Kifisia, and Acharnes. Or for a taste of 1950’s elegance, have a “Chicago” sundae at Zonar’s, a classic Athenian establishment on Voukourestiou street said to have been the first in Greece to serve the famed combination of chocolate ice cream, whipped cream, langues des chat and chocolate syrup with crushed nuts on top.